Do you worry? I do. Is your goal to remove all of the worry in your life? It has been mine for most of my life. I still distinctly remember the fear and worry in college of not knowing what was next. I even remember telling people closest to me, “I wish God would send a postcard with instructions so I know I’m making the right choice.” First, there was a flaw in my thinking that the choice was about what I should do rather than who I am. A lesson I have learned from many respected mentors and leaders like John Maxwell, Michael Hyatt, and others. In our world today, there is a lot of talk about removing barriers, stress, anxiety and roadblocks. While this is often necessary, when it becomes our full focus and effort, we can lose an opportunity to understand where to find answers by moving too quickly past a learning opportunity. No doubt this is not a new idea. I am sure it has formed out of the reading and listening I have done, especially the past 5 years. By listening to other successful people, new ideas come to light and clarity is gained. That being the case, this time it was a conversation with my 10 year old that brought the important piece to the surface. I get to take my son to school daily. This is some great time spent together that I am thankful for. This particular day, I asked him two questions I ask two or three times a week. This time he had a specific thing he was worried about. The elementary spelling bee was coming, and he had been invited to participate and was tasked with studying the word list. His worry was that he was not going to do well during the event because he had not been studying. Without really thinking I said, “You don’t have to worry about that. If you haven’t been studying, you won’t do well. So no need to worry, you already know.” This may sound harsh, but he understood what I meant as I went on to explain that if he isn’t studying, he should expect to not do well. But also that if he is worried and knows studying could help, he can choose. He can either not study and expect to not do well or study and be proud he did his best no matter what happens at the Bee. Either way, the worry is dealt with and not just ignored. I think the lesson here is that we want to remove worry or ignore it, but it is possible that the worry may be revealing some useful information that could help us move to the next level. So here are my suggestions for dealing with worry in your life and mine, not just removing it. Listen to the worry. Don’t dismiss it too quickly. You may miss an important indication that leads you to just the right answer you are looking for. Seek others’ input. We all need people around us to help us in life, especially through difficult times. Find a trusted advisor or mentor and confide in them what is worrying you and see if they can help you gain some clarity about the direction you need to head. Don’t let the worry turn into fear. I cannot count the number of things I have missed out on because I let worry turn into fear and defeat me from accomplishing something before I even started. I am working hard to reduce the number of times this happens in my life, and I hope you will too. 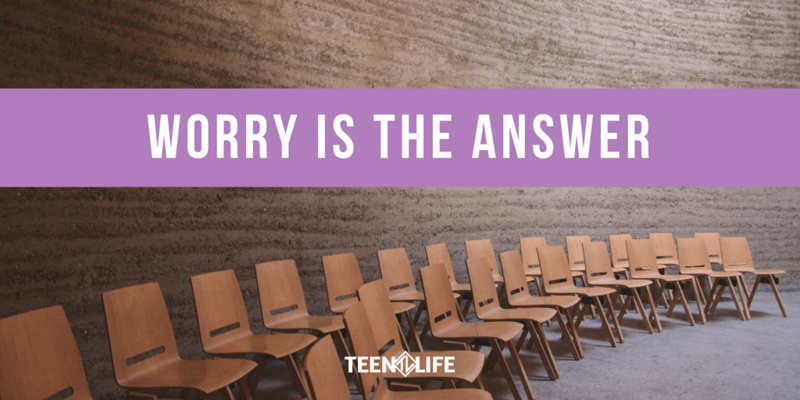 Make a plan to process the worry. Maybe have a dedicated journal or app to record what is worrying you, and then spend time processing what you might be able to learn from the worry. I’ll leave you with this. My son did participate in the spelling bee and he did pretty good, too. He actually did really good! He placed 3rd! Out of nearly 40 students in grades 3-5 at his school, he had the courage, stamina and focus to spell words I’ve never heard of correctly. Was it my comment that made the difference? Probably not as much as I would like to think, but the principle and mental perspective to think differently about what he needed to do, I hope, was helpful. So what in your life have you ignored or tried to remove that could actually have some benefit or provide you with some insight as to how to take your next step and maybe even what that step should be? Let us know!